The Fondmetal brand is synonymous with quality and design. Our wheels go through a rigorous process to ensure they meet the highest standard of quality. The outcome of this a process is TÜV Approval. What Does TÜV Approved Mean? TÜV (Technischer Uberwachungsverein) is of German origin, translated as the Technical Inspection Association. TÜV is the leading and the most competent provider of product testing and certifications for the worldwide marketplace. The certification ensures compliance with domestic and international guidelines, standards and directives. Fondmetal wheels are made in Italy and also sold across Europe meaning that they require TÜV Approval. The Manufacturer Certification process is a test of the manufacturers quality management system at their facility. This is TÜV’s way of ensuring that the facility is capable of generating wheels consistently that hold up to the reputation of TÜV Approval. 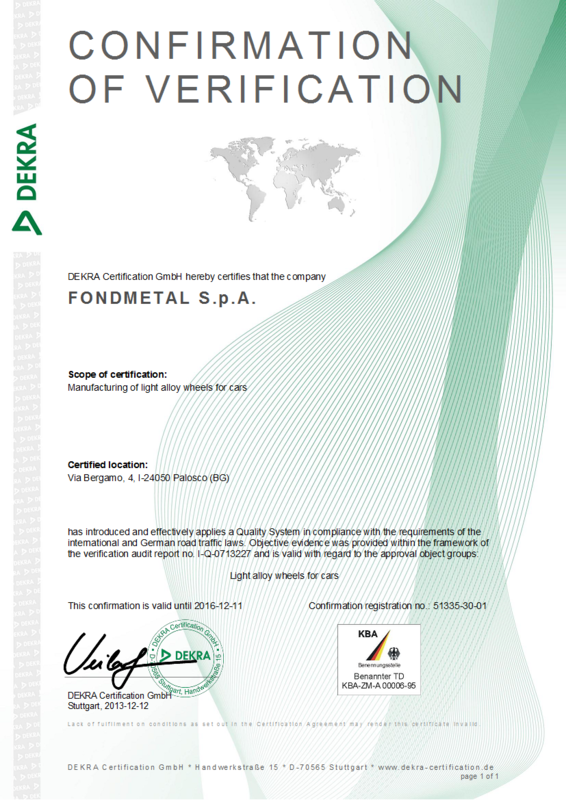 Fondmetal was initially validated in 2006. Our most current certification was given to us in 2015 allowing us to produce TÜV Approved wheels until our next audit in 2018. There are several factors that affect the strength of a wheel, which is why all of our wheels go through the rigorous TÜV Approval process. This process includes Bend Tests, Rolling Fatigue Tests and Impact Tests. All tests are carried out with the appropriate sized tires and fitments relevant to the particular vehicle being tested. Bend Testing is achieved by applying the replicated vertical and lateral loads to the wheel to simulate a car cornering at high speeds. This is very important for performance oriented cars that exhibit this stress to their wheels routinely. Rolling Fatigue Testing is similar to the Bend Test. During this test the weight of the vehicle is simulated on the wheel as the wheel turns at high speeds that are far harsher than normal driving habits. Impact Testing is done to simulate the wheel and tire hitting something in the road with tremendous force at critical stress points on the wheel. Testing for structural weaknesses in design, the impact test is the proving ground for a “strong” wheel. Why You Want TÜV Approved Wheels? At Fondmetal our number one concern is the safety of our customers. We design all wheels with quality in design and safety in mind. We want our Fondmetal customers to have peace of mind that their wheels have been critically tested to make sure that they hold up to high speeds, harsh impacts and heavy loads. Being an Italian Wheel company Fondmetal must keep its TÜV Approval in order to sell to the European market or produce OE wheels for European car brands. Other brands may claim TÜV Approval, but it is important for your safety that you have proof of this. 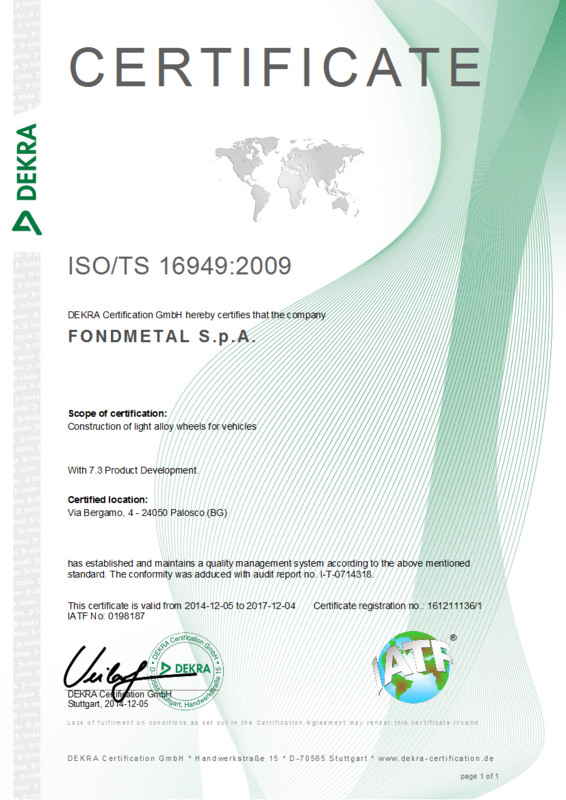 Below is our certification and proof Fondmetal produces TÜV Approved wheels.